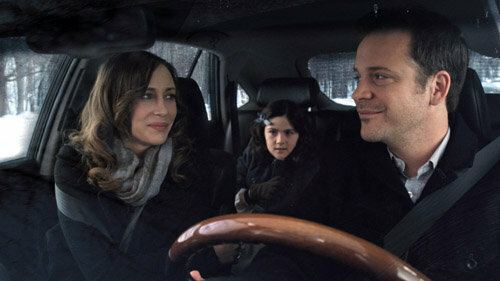 Vera Farmiga and Peter Sarsgaard star as husband and wife Kate and John Coleman, who, after a miscarriage, adopt a wee Russian lass, Esther (Isabella Fuhrman) with a whole lot of baggage. Brought into their existing home with younger daughter Max (Aryana Engineer - [dreadful name]) and older son Daniel (Jimmy Bennett), Esther sets herself promptly to work sowing seeds of distrust and fear among the family, and lusting after her new papa. As the story unfolds, we learn Esther has a history of wrecking havoc and a disorder that actually makes her look younger than she actually is. Director Jaume Collet-Serra does a good building the suspense, even though we see it all coming and the inherent problem with the film is its slowness in developing Esther's back story. Farmiga is great and wee Fuhrman is amazing playing a 30-year in a 9-year-old's body. Props to Collet-Serra for giving us an unconventional non-Hollywood ending vis-a-vis papa too.